With the launch of Apple’s new Mac App Store, it’s even more affordable than ever to upgrade to the newest version of GarageBand, bringing you the incredible new features in GarageBand ’11 including Groove Matching and the mind-blowing (in a $15 multitrack recording application!) Flex Time editing. You can purchase and download GarageBand from the App Store, sold separately, for only $14.99, so you don’t have to update all of iLife if you just want to take your music recording as far as you can. The new version of iPhoto is arguably worth it as well, but there’s no reason to pay full coin to get the non-updated versions of iDVD and iWeb, and get a few new cool features in iMovie (great new audio editing features there…) and the great new books and cards in iPhoto ’11… the point is, if you want to get them separately, well, now you can. The Mac App Store is available as a free software update for Mac computers running Mac OS X v10.6 or later. If you have an earlier version of Mac OS X, you will need to upgrade to Mac OS X Snow Leopard. Of course, Snow Leopard is only $29, and it blows Leopard (and of course Tiger) away… for those of you stuck in the old realms… just go ahead and max out the RAM in your older computer (should cost you a nominal fee… go here Crucial has excellent RAM prices), and once you have some more RAM, just back your stuff up, wipe your drive (this is not hard, people), install Mac OS X 10.6 and then update your GarageBand and anything else you would like to update, and feel like you have a brand new computer. Snow Leopard will only run on Intel machines, but don’t you Mac users have one of those by now? It’s time. It’s incredible what you can get for $1200 now. not to mention the Mac Mini option for the $700 budget. And these machines all come with Snow Leopard, and the latest iLife suite, iLife ’11. 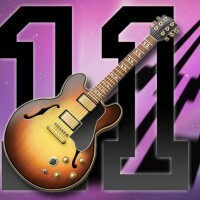 Get updated if you can, and let’s get recording your music and podcasts with GarageBand ’11.